Levetiracetam with NDC 70518-1921 is a a human prescription drug product labeled by Remedyrepack Inc.. The generic name of Levetiracetam is levetiracetam. The product's dosage form is tablet, film coated and is administered via oral form. FDA Application Number: ANDA078154 What is the FDA Application Number? Levetiracetam tablets USP are indicated as adjunctive therapy in the treatment of partial onset seizures in adults and children 1 month of age and older with epilepsy. Levetiracetam tablets USP are indicated as adjunctive therapy in the treatment of myoclonic seizures in adults and adolescents 12 years of age and older with juvenile myoclonic epilepsy. Levetiracetam tablets USP are indicated as adjunctive therapy in the treatment of primary generalized tonic-clonic seizures in adults and children 6 years of age and older with idiopathic generalized epilepsy. Levetiracetam tablets are given orally with or without food. The levetiracetam dosing regimen depends on the indication, age group, dosage form (tablets or oral solution), and renal function.Prescribe the oral solution for pediatric patients with body weight ≤ 20 kg. Prescribe the oral solution or tablets for pediatric patients with body weight above 20 kg.When using the oral solution in pediatric patients, dosing is weight-based (mg per kg) using a calibrated measuring device (not a household teaspoon or tablespoon).Levetiracetam tablets should be swallowed whole. Levetiracetam tablets should not be chewed or crushed.
. Only whole tablets should be administered. Levetiracetam tablets, 250 mg are blue coloured, oblong-shaped, biconvex, film-coated tablets debossed with "L" and "U" on either side of the breakline on one side and "X01" on the other side.Levetiracetam tablets, 500 mg are yellow coloured, oblong-shaped, biconvex, film-coated tablets debossed with "L" and "U" on either side of the breakline on one side and "X02" on the other side.Levetiracetam tablets, 750 mg are orange coloured, oblong-shaped, biconvex, film-coated tablets debossed with "L" and "U" on either side of the breakline on one side and "X03" on the other side.Levetiracetam tablets, 1000 mg are white to off-white coloured, oblong-shaped, biconvex, film-coated tablets debossed with "L" and "U" on either side of the breakline on one side and "X04" on the other side. 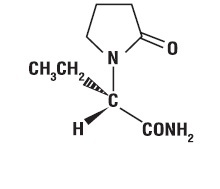 Levetiracetam USP is a white to off-white crystalline powder with a faint odor and a bitter taste. It is very soluble in water (104.0 g/100 mL). It is freely soluble in chloroform (65.3 g/100 mL) and in methanol (53.6 g/100 mL), soluble in ethanol (16.5 g/100 mL), sparingly soluble in acetonitrile (5.7 g/100 mL) and practically insoluble in n-hexane. (Solubility limits are expressed as g/100 mL solvent).Levetiracetam tablets USP contain the labeled amount of levetiracetam. For 250 mg, 500 mg and 750 mg strengths:Inactive ingredients: colloidal silicon dioxide, corn starch, crospovidone, hypromellose, magnesium stearate, microcrystalline cellulose, polyethylene glycol, polyvinyl alcohol, povidone, talc, titanium dioxide, and additional agents listed below:250 mg tablets: FD&C Blue No. 2/indigo carmine Aluminum Lake500 mg tablets: Yellow Iron Oxide 750 mg tablets: FD&C Blue No. 2/indigo carmine Aluminum Lake, FD&C Yellow No. 6/sunset yellow FCF Aluminum Lake, iron oxide redFor 1000 mg strength:Inactive ingredients: colloidal silicon dioxide, corn starch, croscarmellose sodium, magnesium stearate, microcrystalline cellulose, polyethylene glycol, polyvinyl alcohol, povidone, talc and titanium dioxide. PregnancyAdvise patients to notify their healthcare provider if they become pregnant or intend to become pregnant during levetiracetam therapy. Encourage patients to enroll in the North American Antiepileptic Drug (NAAED) pregnancy registry if they become pregnant. This registry is collecting information about the safety of antiepileptic drugs during pregnancy. To enroll, patients can call the toll free number 1-888-233-2334. MEDICATION GUIDELEVETIRACETAM (LEE-ve-tye-RA-se-tam)TABLETS USP 250 mg, 500 mg, 750 mg and 1000 mgRx onlyRead this Medication Guide before you start taking levetiracetam tablets and each time you get a refill. There may be new information. This information does not take the place of talking to your healthcare provider about your medical condition or treatment.What is the most important information I should know about levetiracetam tablets?Like other antiepileptic drugs, levetiracetam tablets may cause suicidal thoughts or actions in a very small number of people, about 1 in 500 people taking it.Call a healthcare provider right away if you have any of these symptoms, especially if they are new, worse, or worry you:thoughts about suicide or dyingattempts to commit suicidenew or worse depressionnew or worse anxietyfeeling agitated or restlesspanic attackstrouble sleeping (insomnia)new or worse irritabilityacting aggressive, being angry, or violentacting on dangerous impulsesan extreme increase in activity and talking (mania)other unusual changes in behavior or moodDo not stop levetiracetam tablets without first talking to a healthcare provider. Stopping levetiracetam tablets suddenly can cause serious problems. Stopping a seizure medicine suddenly can cause seizures that will not stop (status epilepticus).Suicidal thoughts or actions can be caused by things other than medicines. If you have suicidal thoughts or actions, your healthcare provider may check for other causes.How can I watch for early symptoms of suicidal thoughts and actions?Pay attention to any changes, especially sudden changes, in mood, behaviors, thoughts, or feelings.Keep all follow-up visits with your healthcare provider as scheduled.Call your healthcare provider between visits as needed, especially if you are worried about symptoms.What are levetiracetam tablets?Levetiracetam tablets are a prescription medicine taken by mouth that is used with other medicines to treat:partial onset seizures in people 1 month of age and older with epilepsymyoclonic seizures in people 12 years of age and older with juvenile myoclonic epilepsyprimary generalized tonic-clonic seizures in people 6 years of age and older with certain types of generalized epilepsy.It is not known if levetiracetam tablets are safe or effective in children under 1 month of age.Before taking your medicine, make sure you have received the correct medicine. Compare the name above with the name on your bottle and the appearance of your medicine with the description of levetiracetam tablets provided below. Tell your pharmacist immediately if you think you have been given the wrong medicine.Levetiracetam tablets USP, 250 mg are blue coloured, oblong-shaped, biconvex, film-coated tablets debossed with "L" and "U" on either side of the breakline on one side and "X01" on the other side.Levetiracetam tablets USP, 500 mg are yellow coloured, oblong-shaped, biconvex, film-coated tablets debossed with "L" and "U" on either side of the breakline on one side and "X02" on the other side.Levetiracetam tablets USP, 750 mg are orange coloured, oblong-shaped, biconvex, film-coated tablets debossed with "L" and "U" on either side of the breakline on one side and "X03" on the other side.Levetiracetam tablets USP, 1000 mg are white to off-white coloured, oblong-shaped, biconvex, film-coated tablets debossed with "L" and "U" on either side of the breakline on one side and "X04" on the other side.Who should not take levetiracetam tablets?Do not take levetiracetam tablets if you are allergic to levetiracetam.What should I tell my healthcare provider before starting levetiracetam tablets?Before taking levetiracetam tablets, tell your healthcare provider about all of your medical conditions, including if you:have or have had depression, mood problems or suicidal thoughts or behaviorhave kidney problemsare pregnant or planning to become pregnant. It is not known if levetiracetam tablets will harm your unborn baby. You and your healthcare provider will have to decide if you should take levetiracetam tablets while you are pregnant. If you become pregnant while taking levetiracetam tablets, talk to your healthcare provider about registering with the North American Antiepileptic Drug Pregnancy Registry. You can enroll in this registry by calling 1-888-233-2334. The purpose of this registry is to collect information about the safety of levetiracetam and other antiepileptic medicine during pregnancy.are breast feeding. Levetiracetam can pass into your milk and may harm your baby. You and your healthcare provider should discuss whether you should take levetiracetam tablets or breastfeed; you should not do both.Tell your healthcare provider about all the medicines you take, including prescription and nonprescription medicines, vitamins, and herbal supplements. Do not start a new medicine without first talking with your healthcare provider.Know the medicines you take. Keep a list of them to show your healthcare provider and pharmacist each time you get a new medicine.How should I take levetiracetam tablets?Take levetiracetam tablets exactly as prescribed.Your healthcare provider will tell you how much levetiracetam tablets to take and when to take it. Levetiracetam tablets are usually taken twice a day. Take levetiracetam tablets at the same times each day.Your healthcare provider may change your dose. Do not change your dose without talking to your healthcare provider.Take levetiracetam tablets with or without food.Swallow the tablets whole. Do not chew or crush tablets. Ask your healthcare provider for levetiracetam oral solution if you cannot swallow tablets.If you miss a dose of levetiracetam tablets, take it as soon as you remember. If it is almost time for your next dose, just skip the missed dose. Take the next dose at your regular time. Do not take two doses at the same time . If you take too much levetiracetam tablets, call your local Poison Control Center or go to the nearest emergency room right away.What should I avoid while taking levetiracetam tablets?Do not drive, operate machinery or do other dangerous activities until you know how levetiracetam tablet affects you. Levetiracetam tablets may make you dizzy or sleepy.What are the possible side effects of levetiracetam tablets?See "What is the most important information I should know about levetiracetam tablets? "Levetiracetam tablets can cause serious side effects.Call your healthcare provider right away if you have any of these symptoms:mood and behavior changes such as aggression, agitation, anger, anxiety, apathy, mood swings, depression, hostility, and irritability. A few people may get psychotic symptoms such as hallucinations (seeing or hearing things that are really not there), delusions (false or strange thoughts or beliefs) and unusual behavior.extreme sleepiness, tiredness, and weaknessproblems with muscle coordination (problems walking and moving)allergic reactions such as swelling of the face, lips, eyes, tongue, and throat, trouble swallowing or breathing, and hives.a skin rash. Serious skin rashes can happen after you start taking levetiracetam tablets. There is no way to tell if a mild rash will become a serious reaction.The most common side effects seen in people who take levetiracetam tablets include:sleepinessweaknessinfectiondizzinessThe most common side effects seen in children who take levetiracetam tablets include, in addition to those listed above:tirednessacting aggressivenasal congestiondecreased appetiteirritabilityThese side effects can happen at any time but happen more often within the first 4 weeks of treatment except for infection.Tell your healthcare provider if you have any side effect that bothers you or that does not go away.These are not all the possible side effects of levetiracetam tablets. For more information, ask your healthcare provider or pharmacist.Call your doctor for medical advice about side effects. You may report side effects to FDA at 1-800-FDA-1088. You may also report side effects to Lupin Pharmaceuticals, Inc. at 1-800-399-2561.How should I store levetiracetam tablets? Store at 25°C (77°F); excursions permitted to 15 to 30°C (59 to 86°F) [see USP Controlled Room Temperature].away from heat and light. Keep levetiracetam tablets and all medicines out of the reach of children.General information about levetiracetam tablets. The relative risk for suicidal thoughts or behavior was higher in clinical trials for epilepsy than in clinical trials for psychiatric or other conditions, but the absolute risk differences were similar for the epilepsy and psychiatric indications.Anyone considering prescribing levetiracetam or any other AED must balance the risk of suicidal thoughts or behaviors with the risk of untreated illness. Epilepsy and many other illnesses for which AEDs are prescribed are themselves associated with morbidity and mortality and an increased risk of suicidal thoughts and behavior. Should suicidal thoughts and behavior emerge during treatment, the prescriber needs to consider whether the emergence of these symptoms in any given patient may be related to the illness being treated.Patients, their caregivers, and families should be informed that AEDs increase the risk of suicidal thoughts and behavior and should be advised of the need to be alert for the emergence or worsening of the signs and symptoms of depression, any unusual changes in mood or behavior, or the emergence of suicidal thoughts, behavior, or thoughts about self-harm. Behaviors of concern should be reported immediately to healthcare providers. Levetiracetam may cause somnolence and fatigue. Patients should be monitored for these signs and symptoms and advised not to drive or operate machinery until they have gained sufficient experience on levetiracetam to gauge whether it adversely affects their ability to drive or operate machinery.SomnolenceIn controlled trials of adult patients with epilepsy experiencing partial onset seizures, 15% of levetiracetam-treated patients reported somnolence, compared to 8% of placebo-treated patients. There was no clear dose response up to 3000 mg/day. In a study where there was no titration, about 45% of patients receiving 4000 mg/day reported somnolence. 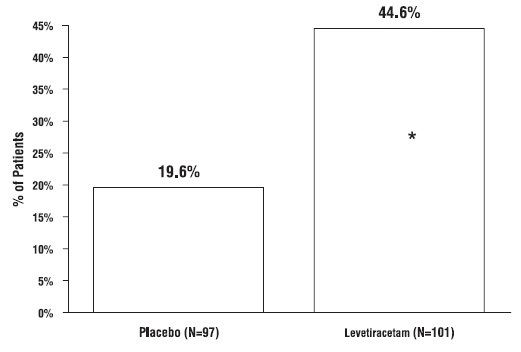 The somnolence was considered serious in 0.3% of levetiracetam-treated patients, compared to 0% in the placebo group. About 3% of levetiracetam-treated patients discontinued treatment due to somnolence, compared to 0.7% of placebo-treated patients. In 1.4% of levetiracetam-treated patients and 0.9% of placebo-treated patients, the dose was reduced, while 0.3% of the levetiracetam-treated patients were hospitalized due to somnolence.AstheniaIn controlled clinical studies of adult patients with epilepsy experiencing partial onset seizures, 15% of levetiracetam-treated patients reported asthenia, compared to 9% of placebo-treated patients. Treatment was discontinued due to asthenia in 0.8% of levetiracetam-treated patients as compared to 0.5% of placebo-treated patients. 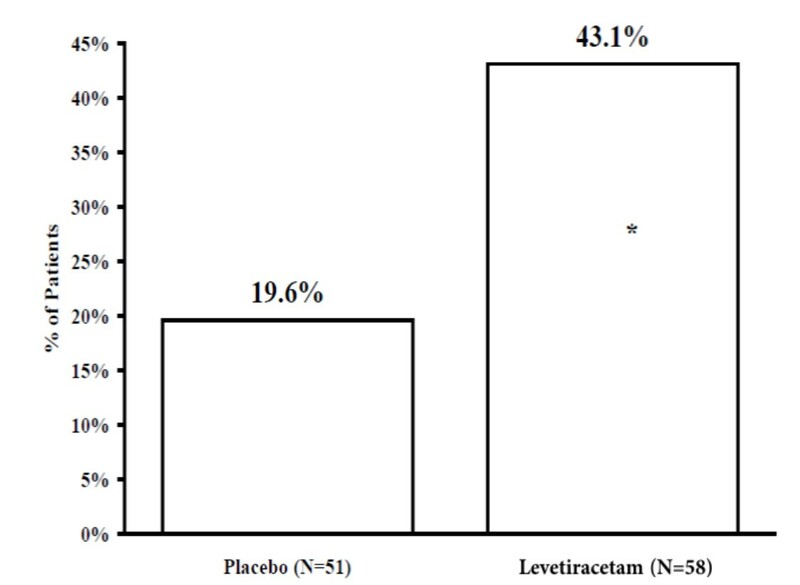 In 0.5% of levetiracetam-treated patients and in 0.2% of placebo-treated patients, the dose was reduced due to asthenia. Somnolence and asthenia occurred most frequently within the first 4 weeks of treatment. In general, the incidences of somnolence and fatigue in the pediatric partial onset seizure studies, and in pediatric and adult myoclonic and primary generalized tonic-clonic seizure studies were comparable to those of the adult partial onset seizure studies. Levetiracetam may cause coordination difficulties.In controlled clinical studies in adult patients with partial onset seizure studies, 3.4% of adult levetiracetam-treated patients experienced coordination difficulties, (reported as either ataxia, abnormal gait, or incoordination) compared to 1.6% of placebo-treated patients. A total of 0.4% of patients in controlled clinical studies discontinued levetiracetam treatment due to ataxia, compared to 0% of placebo-treated patients. In 0.7% of levetiracetam-treated patients and in 0.2% of placebo-treated patients, the dose was reduced due to coordination difficulties, while one of the levetiracetam-treated patients was hospitalized due to worsening of pre-existing ataxia. These events occurred most frequently within the first 4 weeks of treatment.Patients should be monitored for these signs and symptoms and advised not to drive or operate machinery until they have gained sufficient experience on levetiracetam to gauge whether it could adversely affect their ability to drive or operate machinery. ), mean hemoglobin (0.09 g/dL), and mean hematocrit (0.38%), were seen in levetiracetam-treated patients in controlled trials. /L) decreased neutrophil count. Of the levetiracetam-treated patients with a low neutrophil count, all but one rose towards or to baseline with continued treatment. No patient was discontinued secondary to low neutrophil counts. 9/L) decreased neutrophil count. Of the levetiracetam-treated patients with a low neutrophil count, all but one rose towards or to baseline with continued treatment. No patient was discontinued secondary to low neutrophil counts. /L, respectively, whereas there were small increases in the placebo group. Mean relative lymphocyte counts increased by 1.7% in levetiracetam-treated patients, compared to a decrease of 4% in placebo patients (statistically significant). In a randomized, placebo-controlled study in patients 1 month to <4 years of age, a significantly higher risk of increased diastolic blood pressure was observed in the levetiracetam-treated patients (17%), compared to the placebo-treated patients (2%). There was no overall difference in mean diastolic blood pressure between the treatment groups. 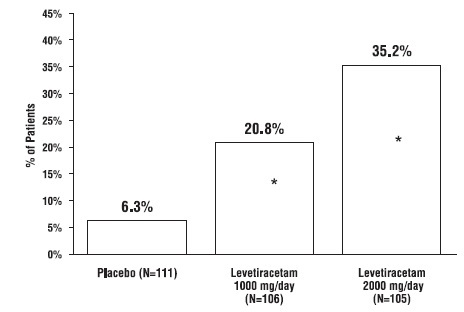 This disparity between the levetiracetam and placebo treatment groups was not observed in the studies of older children or in adults.Monitor patients 1 month to <4 years of age for increases in diastolic blood pressure. 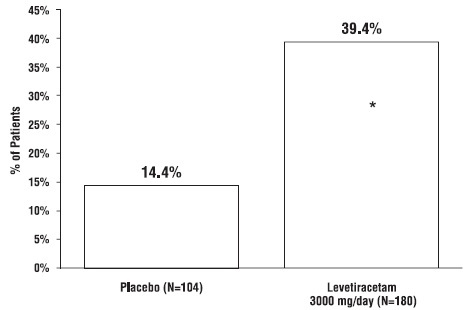 patients receiving levetiracetam in placebo-controlled studies and were numerically more common than in patients treated with placebo. 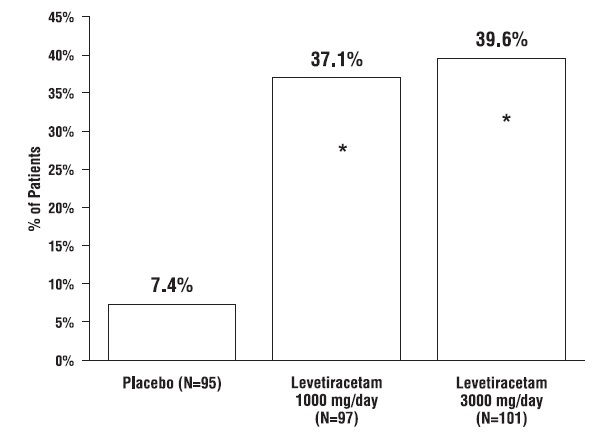 In these studies, either levetiracetam or placebo was added to concurrent AED therapy. 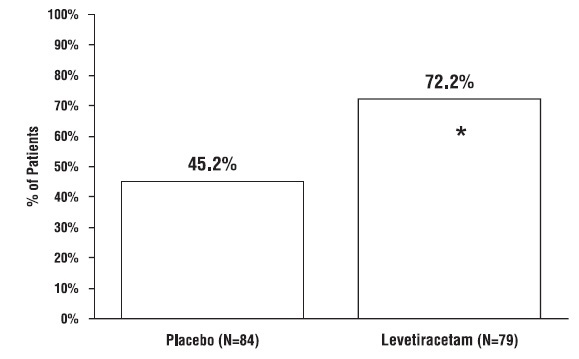 In the placebo-controlled study, 5% of patients receiving levetiracetam and 8% receiving placebo either discontinued or had a dose reduction during the treatment period as a result of an adverse reaction.This study was too small to adequately characterize the adverse reactions that could be expected to result in discontinuation of treatment in this population. It is expected that the adverse reactions that would lead to discontinuation in this population would be similar to those resulting in discontinuation in other epilepsy trials (see Tables 4 and 8).In addition, the following adverse reactions were seen in other controlled adult studies of levetiracetam: balance disorder, disturbance in attention, eczema, memory impairment, myalgia, and blurred vision.Comparison of Gender, Age and RaceThe overall adverse reaction profile of levetiracetam was similar between females and males. There are insufficient data to support a statement regarding the distribution of adverse reactions by age and race. The following adverse reactions have been identified during postapproval use of levetiracetam. Because these reactions are reported voluntarily from a population of uncertain size, it is not always possible to reliably estimate their frequency or establish a causal relationship to drug exposure.The following adverse reactions have been reported in patients receiving marketed levetiracetam worldwide. The listing is alphabetized: abnormal liver function test, acute kidney injury, anaphylaxis, angioedema, agranulocytosis, choreoathetosis, drug reaction with eosinophilia and systemic symptoms (DRESS), dyskinesia, erythema multiforme, hepatic failure, hepatitis, hyponatremia, muscular weakness, pancreatitis, pancytopenia (with bone marrow suppression identified in some of these cases), panic attack, thrombocytopenia, and weight loss. Alopecia has been reported with levetiracetam use; recovery was observed in majority of cases where levetiracetam was discontinued. in utero exposure to levetiracetam, physicians are advised to recommend that pregnant patients taking levetiracetam enroll in the North American Antiepileptic Drug (NAAED) pregnancy registry. This can be done by calling the toll free number 1-888-233-2334, and must be done by the patients themselves. Information on the registry can also be found at the website http://www.aedpregnancyregistry.org/. A 3-month, randomized, double-blind, placebo-controlled study was performed to assess the neurocognitive and behavioral effects of levetiracetam as adjunctive therapy in 98 (levetiracetam N=64, placebo N=34) pediatric patients, ages 4 to 16 years old, with partial seizures that were inadequately controlled. The target dose was 60 mg/kg/day. Neurocognitive effects were measured by the Leiter-R Attention and Memory (AM) Battery, which measures various aspects of a child's memory and attention. Although no substantive differences were observed between the placebo and drug treated groups in the median change from baseline in this battery, the study was not adequate to assess formal statistical non-inferiority of the drug and placebo. The Achenbach Child Behavior Checklist (CBCL/6 to 18), a standardized validated tool used to assess a child's competencies and behavioral/emotional problems, was also assessed in this study. An analysis of the CBCL/6 to 18 indicated on average a worsening in levetiracetam-treated patients in aggressive behavior, one of the eight syndrome scores. Effects on QTc IntervalThe effect of levetiracetam on QTc prolongation was evaluated in a randomized, double-blind, positive-controlled (moxifloxacin 400 mg) and placebo-controlled crossover study of levetiracetam (1000 mg or 5000 mg) in 52 healthy subjects. The upper bound of the 90% confidence interval for the largest placebo-adjusted, baseline-corrected QTc was below 10 milliseconds. Therefore, there was no evidence of significant QTc prolongation in this study. 1/2 of 5 hours across the three dosing levels. The pharmacokinetics of levetiracetam in children was linear between 20 to 60 mg/kg/day. The potential interaction of levetiracetam with other AEDs was also evaluated in these patients. Levetiracetam had no significant effect on the plasma concentrations of carbamazepine, valproic acid, topiramate or lamotrigine. However, there was about a 22% increase of apparent clearance of levetiracetam when it was co-administered with an enzyme-inducing AED (e.g. carbamazepine). 2 or systemic exposure [AUC] basis). Store at 25°C (77°F); excursions permitted to 15° to 30°C (59° to 86°F) [see USP Controlled Room Temperature].Pharmacist: Dispense in a tight, light-resistant container with child-resistant closure along with medication guide provided separately.